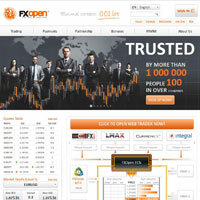 FXOpen focuses on Forex trading. It offers a wide range of Forex trading tools, plus bonuses, auto-trade and PAMM technology services to help newcomers. There are several account types to choose from, allowing users to invest in digital currencies (such as Bitcoin or Peercoin). If you don’t have a lot of money to invest, FX Open also allows you to trade with minimum deposits of just $1.00. There are also several trading platforms to choose from to suit your lifestyle and trading preferences. It’s important to remember that you can lose money whilst trading online. A wide range of Forex trading tools, plus bonuses, auto-trade and PAMM technology. There are several accounts to choose from, each with different benefits depending on your particular requirements. For example, the ECN account allows you access to electronic communication networks which are relevant to Forex markets, such as banks, brokers, companies and private investors. This account provides competitive prices and spreads, with quick execution, making sure there are no dealing conflicts between you and the broker. Minimum deposits are $100 and commission starts from $1.50 per standard lot. The STP account is similar, except that you can start with a deposit of just $10.00 (terms may differ, please check the website for details). The Crypto account lets you trade in Bitcoin, Namecoin, Peercoin and Litecoin, directly against the US dollar, Russian Ruble or Euro. Leverage is up to 1:3. Micro accounts provide usual access to Forex markets, but you can deposit as little as $1 and still gain the benefits of instant execution, no commission and floating spreads. CFD options are available too, and we’ll provide more information about those options towards the end of this review. There are several trading platforms to choose from on FXOpen.com. 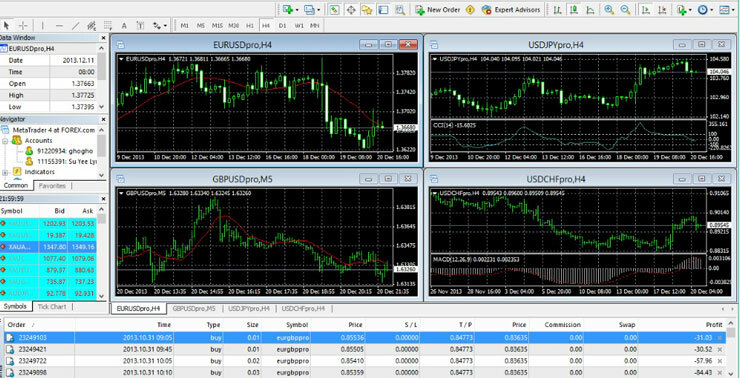 Most of them utilise the MetaTrader 4 system, varying elements to suit different markets. You can download MT4 for free from the website, or opt for a web-browser trading option. If you’d like to trade on the move, a mobile option is also available. MT4 is a well respected trading platform, widely used across many online trading websites. It allows you to control the amount of detail in your data, build graphs, and view multiple data sources at once. MT4 provides access to a variety of comprehensive data sources on a single screen. With so much focus on Forex trading, FX Open also offers several tools which may help you to successfully trade currency pairs. One-click trading allows you to catch deals in an instant. This tool also provides 5 levels of market depth so you can check on the volumes of liquidity for currency pairs. Additionally, you can set order sizes, set your Stop Loss and Take Profit limits and more. Margin and pip calculators help you to work out the potential profit from any trade, with exact conversion rates provided on currency exchanges. Commission calculators also help to work out how much might be deducted from ECN profits. Several generous bonuses are offered for new and existing members, including a free $10 for new STP accounts. Whilst some trades are commission-free, others may incur a charge, so it’s important to check on these rates before you decide to trade as you may not make quite as much profit as you first calculate. Generous bonuses are offered for new and existing members. There are two key trading instruments available on FXOpen. Whilst it’s primarily a Forex trading website, there are also CFD options, so let’s look at those now. Trade on major currency pairs, starting with as little as $100.00 in most accounts (or just $1 using a Micro or Mini account). You can trade 24 hours a day, 5 days a week, with high liquidity and competitive prices. Market analytics are available to help provide data and tips on future trades, with the latest Forex market news at your fingertips. If you’re new to Forex trading, you can try the demo account to practice your techniques before investing real money. There are also workshops, video tutorials and charts for beginners to get a grip on currency exchanges. Should you wish to simply follow the actions of other traders, that’s also possible here, with expert advisers who make trades on your behalf. Contracts for Difference are available on FXOpen.com. These open up a much wider array of markets and products, such as major indices (global markets) or commodities (such as oil, gas and metals). CFDs are traded using UCN accounts and the MT4 platform, providing varied portfolio options, floating spreads (starting at 0 pips) and low margins (from 1%). FX Open has some great trading tools for the Forex markets. However, with its CFD options aside, you won’t find many other trading opportunities. If you’re only interested in currency exchanges and the occasional indices or commodities investment, that’s no problem, but it could be limiting for some traders. The tools and website seem more suited to beginners than advanced traders, with guides and features which help to support new traders, but that’s a big plus if you’re just starting out on the Forex markets.